Three teenagers are forced to stand facing a wall during an Operation Wanya Tsotsi routine stop and search. Members of Operation Wanya Tsotsi bang on the door of the shack and shout at those inside to open up. After a couple of minutes, there’s the sound of someone unlocking a chain, then the door opens a fraction with a creak of its rusty hinges. The members barge the door open the rest of the way and pour inside to find two young men in hoodies with dazed expressions sitting on the bed. One of them is pulled outside and told to point out where he hides his drugs. Operation Wanya Tsotsi claim that these two men are known dealers, and that they usually bury some of their stash amongst the piles of garbage and the bushes outside their shack. But once the first suspected dealer is outside he turns tail and makes a run for it down the street. A couple of Operation Wanya Tsotsi members chase after him into the darkness, but soon return, having lost track of him, cursing under their breath. Back in the shack, things are not going well for the other suspected dealer. After a thorough and ruthless search, large quantities of cannabis, a few mandrax tablets and a purse full of wads of cash have been found, all of which Operation Wanya Tsotsi confiscates. The members crowd around the man on the bed, demanding to know who he is selling drugs for. At first, the young man is afraid to talk, so Operation Wanya Tsotsi “loosen him up” with some firm slaps around the face interspersed with a few jabs to the thighs and ribs with a Taser. A female member grabs him by the balls. With each infliction of violence, the young man lets out a high-pitched scream, much to the amusement of younger Operation Wanya Tsotsi members. Eventually, he gives up the name and address of the man he and his roommate buy their drugs from, a local kingpin also known to Operation Wanya Tsotsi. They find his shack not far from the young men’s, and bang on the door. In many ways, this incident seems to sum up the limitations of Operation Wanya Tsotsi’s attempts to combat crime in Galeshewe. According to Pantsi Obusitse, the group’s chairman, the township is becoming increasingly saturated by drugs, brought in by syndicates from Gauteng and even as far away as Cape Town. Drugs, in turn, are the main driver of crime in Galeshewe, with users pushed to steal and rob to get a quick buck to feed their drug habits. “They’ll steal your cell phone at knife point, they’ll even stab you for it. Then they’ll sell it, even for R70, when maybe it’s worth R2,000, they don’t even care,” Obusitse says. With no state protection, no training, limited weaponry, fluctuating membership numbers and police cases still open against some members, Obusitse says Operation Wanya Tsotsi can only go so far up the drugs food chain. Their operations are therefore largely restricted to routine stop and frisks and confiscating drugs from low level street peddlers and users. Members of Operation Wanya Tsotsi search the residence of suspected drug dealers in Galeshewe. 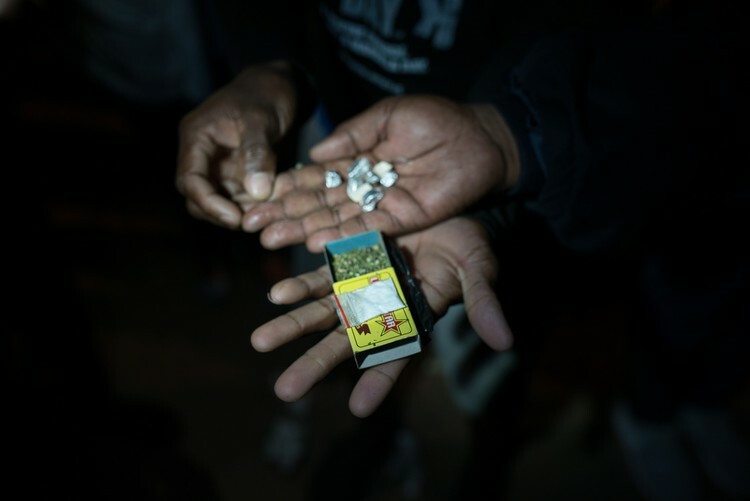 Many of Operation Wanya Tsotsi’s members blame the spiralling drug problems in Galeshewe on the township’s small but burgeoning Nigerian population. However, a Nigerian man GroundUp spoke to at a local tavern, who wished to remain anonymous, said Nigerians are discriminated against and harassed by Operation Wanya Tsotsi. He added that although some Nigerians in Galeshewe are forced to sell drugs because there are no other jobs available to them, many, like himself, are unfairly targeted. While Operation Wanya Tsotsi may have overwhelming support in Galeshewe, there are inevitably some, such as the drug kingpins, who see them as a hindrance, and the higher the stakes, the more this could pose a risk to members of the group. Already on one occasion in 2016, members of Operation Wanya Tsotsi were attacked by a group of migrant workers (South African). Five members ended up in hospital with knife wounds. Then in May this year, Operation Wanya Tsotsi had to call the SAPS Flying Squad to the rescue after they were cornered by a hostile group of residents who were threatening to kill them. Both incidents occurred in an area called Phutanang on the fringes of Galeshewe, a hotspot for drug dealers. Mathloko, Obusitse and other members of Operation Wanya Tsotsi also believe that there is widespread corruption within local SAPS, and that certain police officers are colluding with criminals. This claim is supported by Linja van Wyk, who runs a private security company in Kimberley. A SAPS officer that GroundUp spoke to who wished to remain anonymous also acknowledged that corruption is a “serious problem” in local police. Mandrax and dagga are the drugs most often confiscated during Operation Wanya Tsotsi’s routine stop and searches. Tik is also increasingly common. 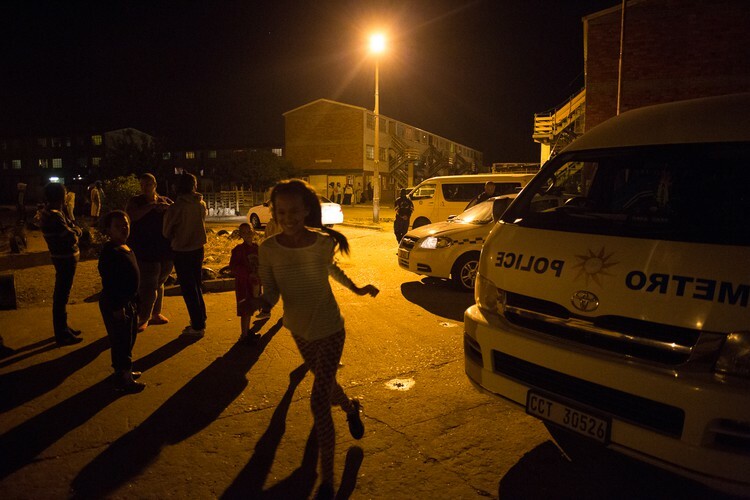 In cities across South Africa, alleged corruption within SAPS has often been linked to the thriving illegal drugs trade and the impunity with which drug dealers are allowed to operate, probably nowhere more so than on the Cape Flats. 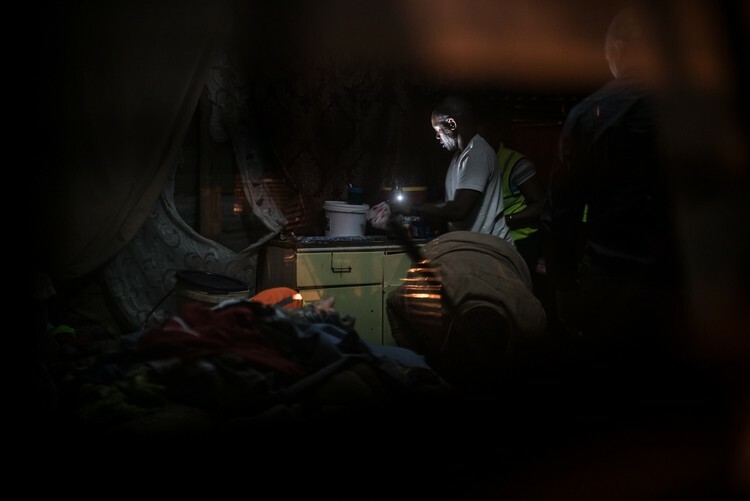 As with both Operation Wanya Tsotsi in Galeshewe and Mapogo A Mathamaga before them in Limpopo, neglected, angry and disillusioned communities on the Cape Flats have often felt compelled to take the law into their own hands. The most enduring example of this is found in People Against Gangsterism and Drugs (PAGAD), a vigilante group which forms another interesting point of comparison with Operation Wanya Tsotsi. PAGAD, like Mapogo, first came into the spotlight in 1996 when a large crowd gathered at Gatesville mosque in Athlone and decided to take a stand against the spiraling problem of drug related crime. The crowd proceeded to murder Rashaad Staggie, a notorious Cape Flats drug dealer, outside his family’s home in Salt River. Staggie was shot multiple times and set alight. 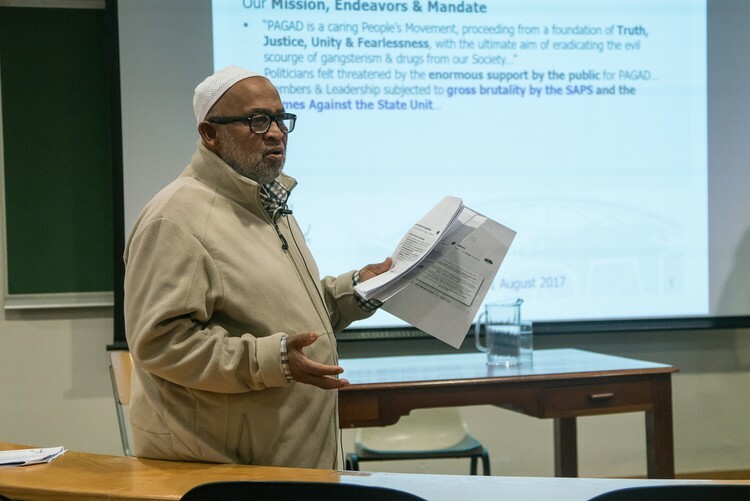 PAGAD has been dogged by controversy (the group was implicated in a number of incidents of terrorism in Cape Town between 1998 and 2000) and burdened by the long-term imprisonment of a number of its leading members for murder. Today, PAGAD continues to operate out of a small, rundown Athlone office that smells of old cigarette smoke, where executive members, many of whom have been part of PAGAD since the 1990s, claim the group’s focus is now more on proactively combating drugs. Activities include life skills workshops, prayer meetings and counselling. The PAGAD office also serves as a half-way house for a handful of recovering drug addicts, who sleep on mattresses on the floor. Pinnock also says that there is a widespread sense in communities on the Cape Flats that many police officers are in collusion with the gangs and therefore “cannot be trusted” to combat gangsterism. This claim was most recently substantiated by the arrest of three SAPS officials who facilitated the provision of fraudulent and illegal firearm licences to gang leaders. “No one is going to take them seriously until they get with the program with regard to topics like decriminalisation and international debates around harm reduction,” he says. There is “not a chance in hell” that PAGAD have made any sort of meaningful impact on the proliferation of drugs, gangs and gangsterism on the Cape Flats, he says. Ebrahim Francis of PAGAD gives a presentation at UCT, raising concerns about decriminalising drugs. Nevertheless, PAGAD continues its long-term quest for legitimacy, sporadically attending community gatherings and marches across the Cape Flats and beyond. Recently the organisation gave a presentation about the dangers of decriminalising drugs at UCT, where it again called for more consideration of the local context. Don Pinnock says that Cape Flats communities have little faith in the ability of the police to combat rampant gangsterism.